Easter Day is always a special day in every church in the world because it celebrates the fact that Jesus rose from the dead. This is celebrated in many different ways. Eggs are often used,, both chocolate and real eggs as an egg is a symbol of new life. Eggs can even be painted in some countries. 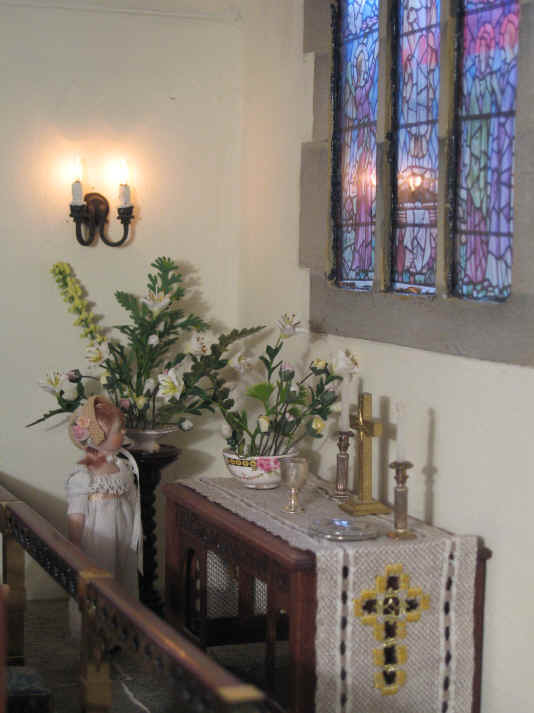 In St. Hilary's the children always enjoy Easter Day. 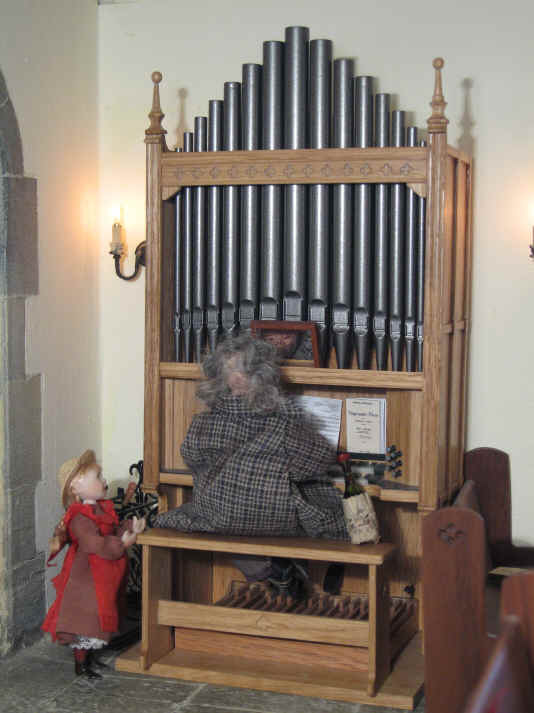 Adele arrived at church early on Easter Sunday morning and was shocked to hear the organ being played! She knew it was too good to be Phoebe. She couldn't believe her eyes when she walked in because there was Homer...............playing a piece of Bach.......SO beautifully too..........AND using his feet on the pedals! She had to interrupt him and ask him how he came to play so well. Homer told her that he was an organist in Germany many years ago. 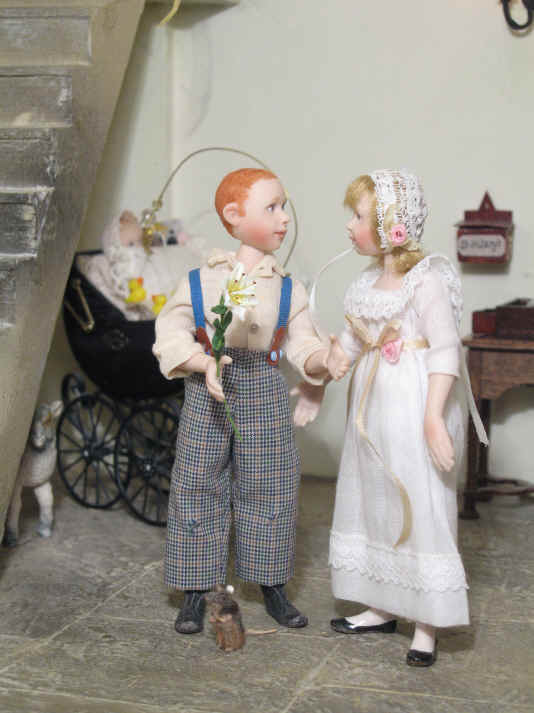 He told her stories about all the different organs he used to play there in churches, halls and minsters and she was transfixed. As Homer was talking to her Adele was suddenly disturbed by a tapping sound at the church door. She went to the door, opened it slightly..........and who did she see but...........a young lamb begging to be let in! Oh dear.......poor Adele was a bit worried about this. The lamb begged her to let him in because he had become lost and didn't know where his mother and twin brother were! Adele has a soft heart so she let him in straight away. Oh dear! Something is missing here! Can you see what it is? It is poor Georgie's lead. We wonder WHERE it has gone! Who has Robert Alexander let take it and why? Adele asked Georgie and Robert Alexander if she could borrow the lead so that she could put it on the little lamb that came into church. She felt so sorry for the lamb as it was lost and she didn't want it to wander off again. 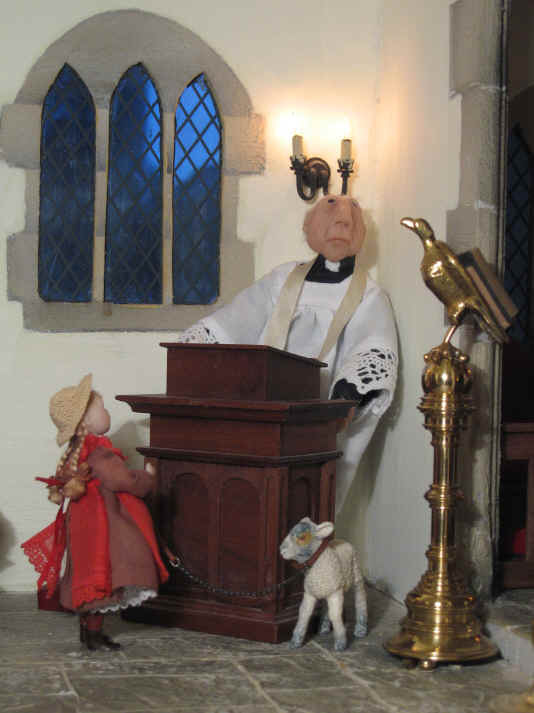 Adele is telling the vicar all about this little lamb as you can see! Ambrose has arrived! AND he has a beautiful white Easter lily in his hand. He is offering it to Alice, his girlfriend. She was delighted with it. Ambrose had begged the flower ladies to let him "borrow" one of the water lilies because he wanted to impress Alice with it! It has certainly worked hasn't it? Sepp, Homer's pet rat, is trying to sniff the flower! 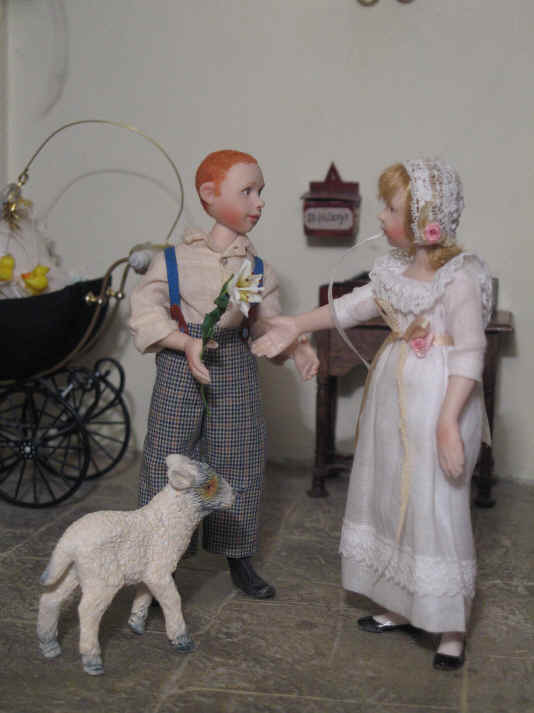 Ooh.........looks who has also arrived just as Ambrose was presenting Alice with this beautiful Easter lily? It is the twin brother to the lost lamb that Adele let in to the church. The twin brother realised that his brother had wandered off and had decided to come and look for him! It is a good thing that Adele had kept the little brother lamb on a lead so that he didn't wander off again isn't it? Both lambs happily skipped out of church together and were soon reunited with their mum. 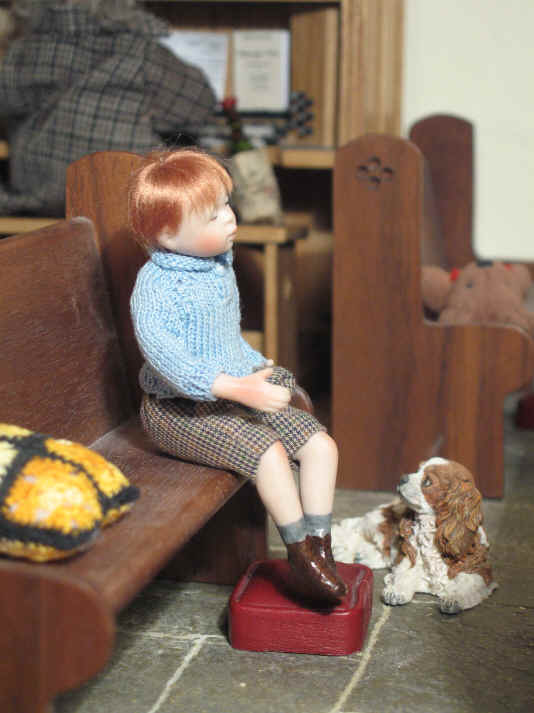 He was worried he wouldn't be able to reach so the vicar brought out this special wooden box for him to stand on! You can all see him practising here! Alice is also practising reading her lesson too as she stands at the eagle lectern. The flowers in the sanctuary and on the altar look so beautiful! The Easter lilies arranged by the flower ladies are particularly lovely this year and Megan is transfixed by their beauty. She KNEW this was going to be a beautiful and lovely Easter Sunday morning service with these flowers adorning the church! The two lambs were bought in "The Early Learning Centre" children's shop for the princely sum of just £1 each! Many thanks to Catherine Davies for the white Easter lilies. She made them especially for Easter Sunday in St. Hilarys. They are made out of fimo. 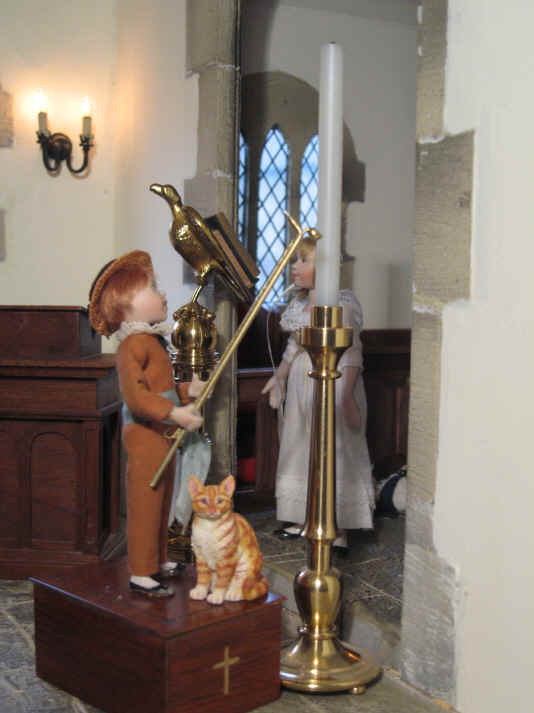 The Paschal candle has been made especially for us by John Cheal. (visit his website www.savedintime.co.uk and see more!) As with the eagle lectern it is modelled on the full size article in Holy Trinity Church, Stratford upon Avon. The candle is made out of brass and John tells us the wick is real! It is black so that it looks as if it has already been lit and snuffed out. The year has been left out so that we can use this year after year.